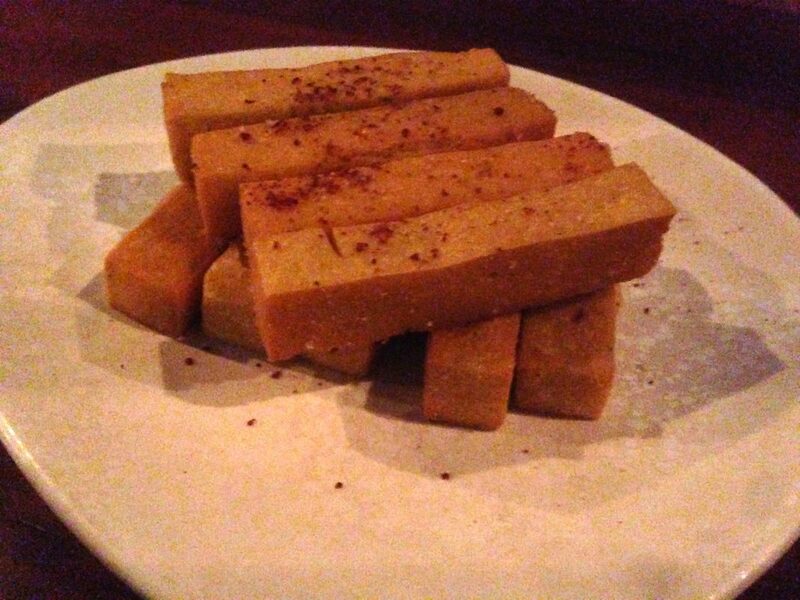 Early in March, sixteen members of our vegan dining group got together to eat at Maha. Maha is one of my favourite fine dining restaurants and they look after vegans incredibly well. We started with a visit to the table from Shane Delia. He said that they no longer have a vegetarian menu but a vegan menu with vegetarian additions. This is such a wonderful approach. I have eaten far too many vegan dishes that started life as vegetarian with all the flavour removed. He also said that the chefs in the kitchen all like the challenge of cooking for vegans. It was great to see vegan food taken seriously. We ordered the five course banquet at $95. Here is what we ate. Unfortunately the batteries on my camera were flat so all I have are photos from my phone. 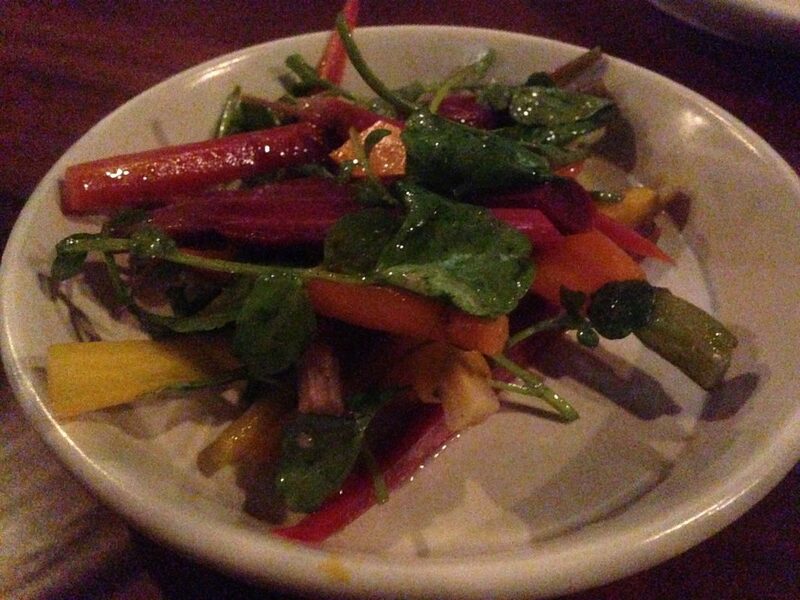 We started with two shared plates, some spiced chickpea chips and carrots dressed with lemon. Next came the individual plates. 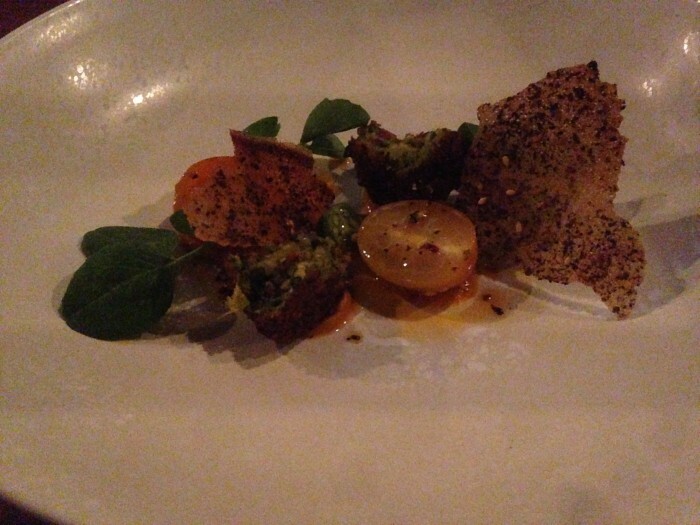 Zucchini falafel with spiced pumpkin puree, tomato and zataar sesame wafer. 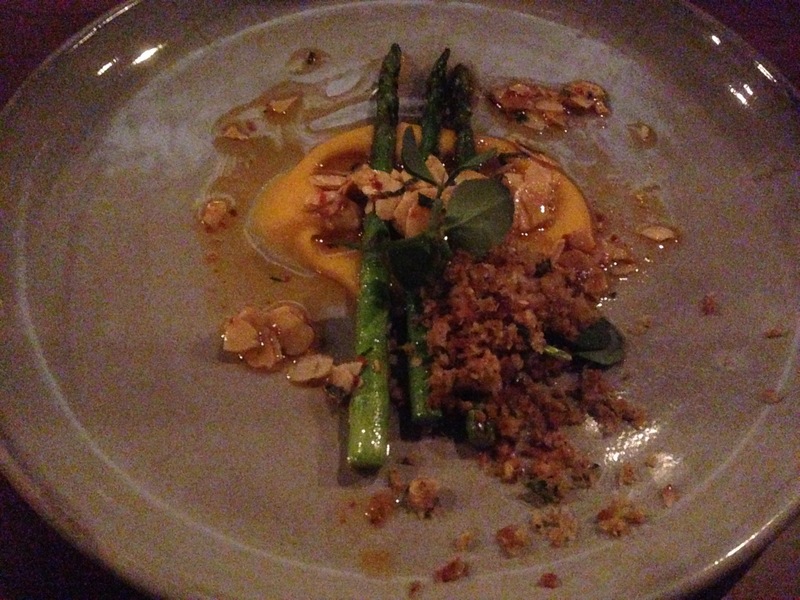 Next a beautiful dish of grilled baby corn, enoki mushrooms and hazelnuts on a cauliflower puree. 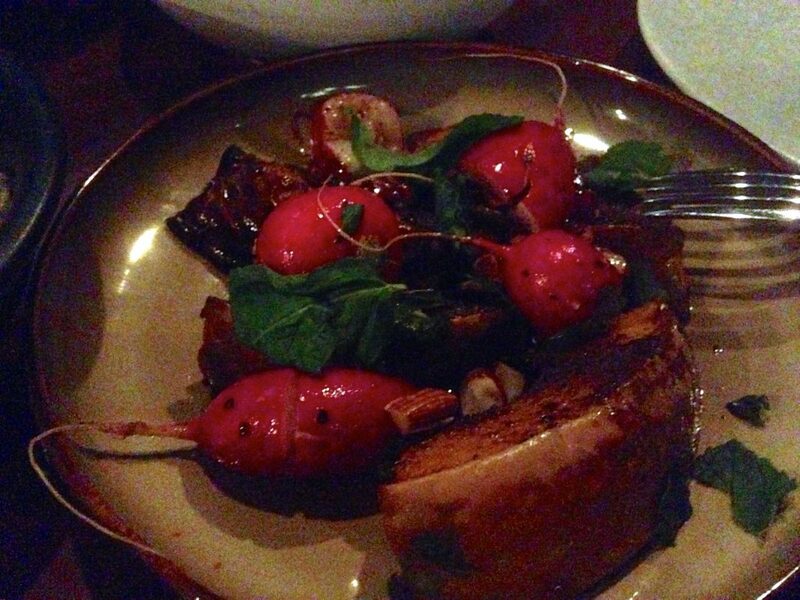 These included roasted ras el hanout pumpkin, radishes and mint. 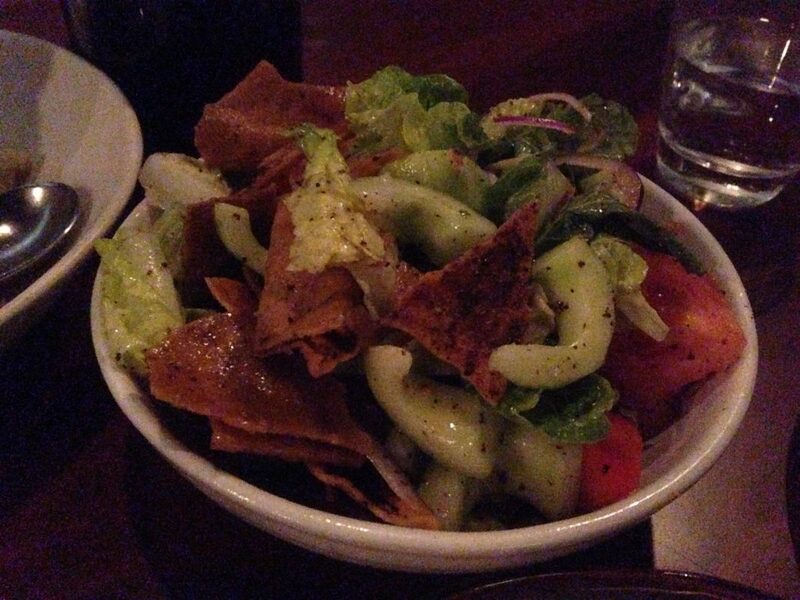 A fattoush salad which was incredibly delicious with its tart flavours. 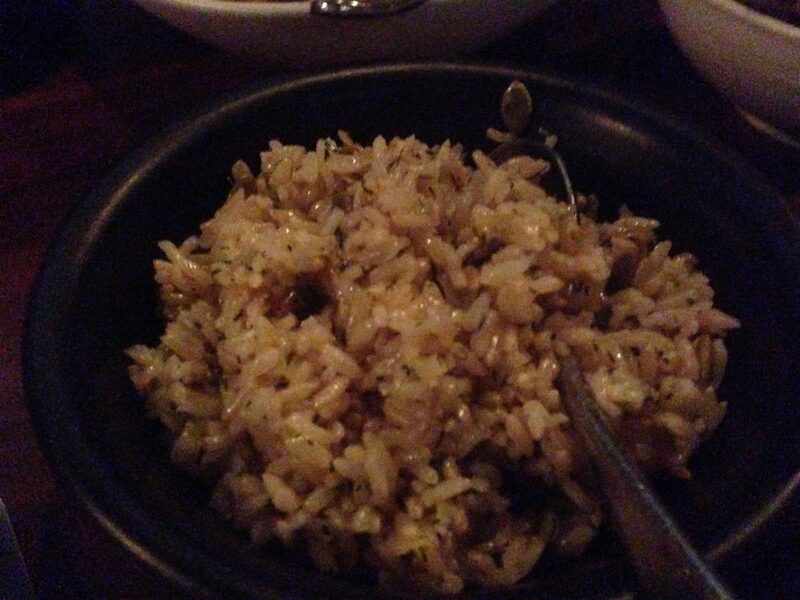 A rice pilaf with toasted pumpkin seeds. 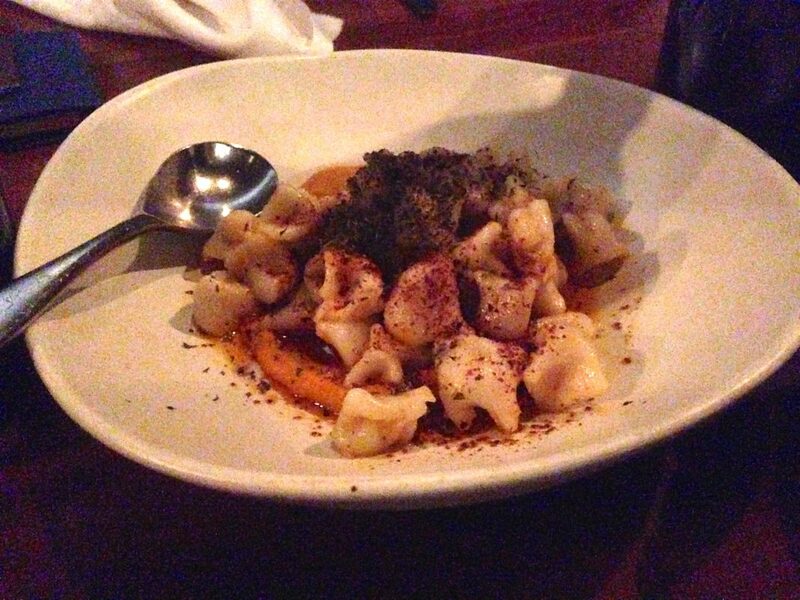 And lastly some red lentil stuffed manti (Turkish dumplings) with a carrot puree and aleppo pepper dressing. Dessert was a pistachio sponge with pineapple foam and a watermelon and rosewater granita. Those of us who’ve been lucky enough to eat at Maha before, know how delicious the turkish delight stuffed donuts are, so we ordered a donut each. Maha is so good for vegans. Delicious flavours and a combination of rustic and refined food at what I think is a very reasonable price for the quality. Lunch is a particular bargain at around half the price of dinner with similar food. That all looks brilliant, I think I’d even love the donuts even though I’m not a fan of Turkish delight. I still haven’t gone to Maha but really must get a move on! All delicious. Lunch is a bargain too. I had a look at the vegan FB group and it was the first I had heard of Maha – sounds like a fantastic menu and I think the approach of starting with vegan and adding some vegetarian frills is a great one! In fact I think most restaurants would have far healthier and more interesting meals if they built them that way rather than starting with a chunk of meat! I so loved when he said that the approach was to start vegan. It makes for great food. He also said that the chefs like the challenge of serving vegan food. In our family we have some ‘big’ birthdays to celebrate this year. I’d heard about Maha and wondered if it would be fitting. I think you’ve answered my question! It’d be lovely for a big occasion, classy but not stuffy. Lunch is a bargain too, half the price for similar food, but all shared plates. The other Maha review was a lunch. 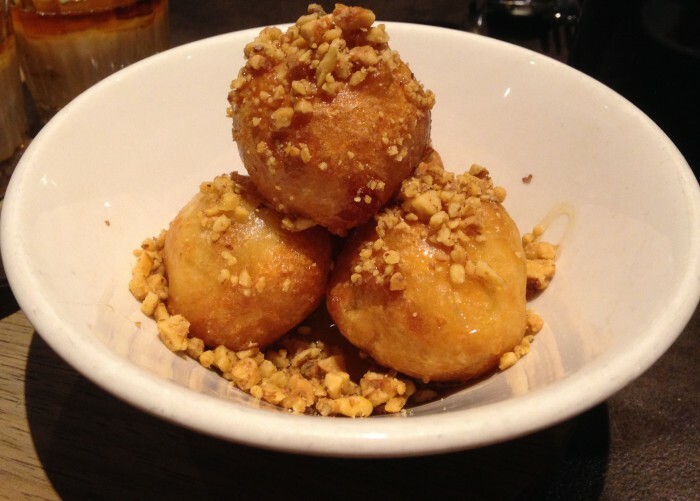 Wow, I’ve never heard of Maha but am glad I have now – those donuts! !